Happy New Year! There's no doubt the winter season in Fort Collins is undeniably stunning and is one of the best times of the year to plan a trip. 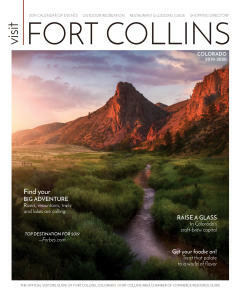 Fort Collins offers plenty of activities during the winter from fat biking and snowshoeing to the ultimate foodie escape, there are so many reasons to visit Fort Collins this winter. Let us help you plan your weekend out with the itinerary below. Mugs is locally owned and operated. The coffee lounge also always tries to locally source when possible. Mugs is rumored to have the best breakfast burritos around and the coffee is superb. They truly believe coffee shops very well may be one of the last remaining daytime social gathering spots in most communities. Just because there is snow on the ground doesn’t mean you can’t enjoy one of the best outdoor recreation sports Fort Collins has to offer…Mountain Biking. Fat Tire bikes allow for you to cycle through the snow on the same trails that you love during the summer. Take a tour with Front Range Ride Guides and leave the stress of research and rentals behind. This local city butcher and deli offers the perfect after-recreation meal with high quality ingredients and tasty craft beer. Enjoy a relaxed lunch after your morning of Fat Tire Biking and get the fuel you’ll need. Fort Collins is home to over a dozen craft breweries including nationally recognized New Belgium Brewery and Odell Brewing Co. Enjoy an afternoon at one of our local breweries small or large and wind down after your outdoor adventure. Fort Collins is home to around 50 natural areas including 100 miles of trail and over 40,000 acres of preserved and protected habitat. These areas are perfect for your next recreational outing. Enjoy activities such as fishing, mountain biking, hiking and more as you take a step into nature. These Natural Areas are open the public and conveniently located at different areas all over town for that perfect mid-day getaway. Set in the heart of Old Town, Beau Jo’s is legendary among Colorado outdoor enthusiasts. They have been offering award-winning Colorado Style Pizza for over 30 years. Beau Jo&apos;s is also considered one of the "Top Insider Spots in the U.S." according to Travelocity. Tucked away in Old Firehouse Alley in Old Town Fort Collins, this cozy bar offers a great environment to relax and sip on some brews. The bar houses 10 rotating taps with beer that never disappoints. The Rainbow is a family owned restaurant specializing in vegetarian breakfasts, lunch and dinners for the past 38 years. Rainbow guests come for the great fresh taste and personal touches that are the hallmarks of the local establishment. The Rainbow also offers non vegetarian options for guests who prefer to eat chicken, turkey or breakfast meats such as ham, Canadian bacon or bacon. The Poudre Canyon offers beautiful views during the winter season. Rent your gear in town and head up the way to a snowshoeing adventure of choice. Mineral Spring Gulch: Located in the Poudre Canyon this trail is great for a short, mid-winter excursion. It is 4 miles long, an out-and-back trail and great for beginners. Little Beaver Creek Trail: Located in the Poudre Canyon this trail is great for early season snow and is moderate in skill level. It is 2 miles long, out-and-back and gains 1,500 ft. in elevation. Big South Trail: This 6 miles trail is located within the upper reaches of the Poudre Canyon and offers stunning views of frozen waterfalls. It is an out-and-back trail with moderate difficulty and gains 560ft in elevation. Green Ridge Road: Located in the upper reaches of the Poudre Canyon, this moderate difficulty trail offers great views from and of several frozen lakes and travels through the rolling forest. At only 3 miles long this snowshoeing trip is perfect for a quick out-and-back trip. Blue Lake: As one of the most popular snowshoeing spots in the upper reaches of Poudre Canyon, this trail offers an easier short, round-trip excursions or a more challenging, all-day adventure. This trail is 4.75 miles one-way and offers beautiful views of Blue Lake surrounded by towering mountains. Trap Park: Located in the upper reaches of the Poudre Canyon this moderately difficult trail follows a small canyon for 11.5 miles and offers beautiful views of the Neota Wilderness and beautiful riparian area. JAX Mercantile is a local Fort Collins sportsman shop that sells gear for all your local outdoor adventures. Rent your snowshoeing gear here before you head up the canyon and you’ll be sure to get expert advice and fitting from the staff. The Mishawaka is a local’s favorite lunch spot to finish off a day of recreation in the Poudre Canyon. This live music amphitheater by summer is also a cozy mountain restaurant that sits atop the river. During the winter you can get tasty pub foods and hearty dishes to fuel up after your long day of winter recreation. Horse and Carriage rides can be booked almost every night in Old Town. This is a chance to take in the beautiful scenery of Historic Old Town Fort Collins in a more intimate setting under the beautiful Holiday Lights, and maybe some light snow fall to make the experience ever more memorable. Envision you and that special someone cuddled up underneath a blanket while rolling along the historic streets of Old Town, soaking up that romantic moment. It doesn&apos;t get much better than that. One of Fort Collins’ first breweries, CooperSmith’s serves fine beer and fine food alike. Enjoy patio dining at its finest and the hustle and bustle of Old Town Square.